We specialize in the manufacture and supply of a wide range of Standard Hydraulic Cylinders (ISO/DIN) for industry. We bring forth a wide comprehensive range of Customised Hydraulic Cylinders , which is available in varied sizes to successfully cater to the requirements of the clients. .
We offer our clients with Customised Pneumatic Cylinders that are fabricated using quality hard anodized aluminum cylinder tubes. We offer a quality range of Hydraulic AGC Cylinders which finds its application in various industries. Our precision engineered range is known for its long and smooth operation in all types of conditions. We are a leading manufacturer and supplier of Cylinders with Rod Measuring Systems known for its lowest price and optimum performance. Fabricated using quality tested raw material and advanced machines, our range of Cylinders For Water Based Hydraulics finds application in various mining and allied industries. We bring forth a wide comprehensive range of Multi Stage Cylinders, which is available in varied sizes to successfully cater to the requirements of the clients. We manufacture rotary swivels with upto 14 ports. Rotary Swivels are precision engineered mechanical devices used to transfer fluid from a stationary source, such as a supply pipe, into a rotating piece of machinery. These swivels are engineered to endure a large range of temperature and pressure for a variety of conditions and environments. Our range is widely used in Mobile cranes and steel plants. We offer Clamping Cylinders, which are used primarily to actuate closed centre power chucks. However, when used with open centre power chucks, they provide a partly open chucking system, which allows long workpieces to be pushed into the front of the lathe spindle. 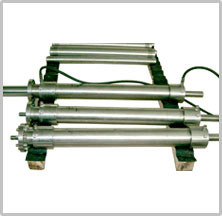 These Clamping and De-clamping cylinders are manufactured for Steel Plants. We also produce Spring loaded cylinders. We specialize in manufacturing custom built Power Packs for Steel plants in Defence Applications. These hydraulic power packs are painted with polyurethane paints, to avoid corrosion. Utmost care is taken to ensure that Quality Standards are maintained throughout the manufacturing process. Our entire range is highly acknowledged for its features including high quality, corrosion resistant, reliability, durability, longevity, high strength, etc.